I just finished my two and a half months internship with Femina. It was my first job in media. My friend Rapti, from my Diploma class had asked her colleague Ashima to interview me for Ahmedabad Mirror for a features section. Ashima and I kept in touch; who recommended me to Shivli Tyagi, the Features Editor of Femina Gujarat. 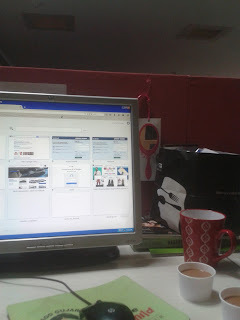 (Both Ahmedabad Mirror and Femina offices are in the Times of India building) She reads my blog and hence thought I would fit the job. And she was right. I enjoyed myself and got to learn a lot. Femina’s tagline, ‘Be unstoppable’ is apt as that’s the spirit of the magazine. My work was pretty much the same. Unstoppable- as I enjoyed every bit of it. I not only wrote about fashion, beauty, food reviews and interior but also managed photo shoots and covered PR events and interviews. Though I have a Diploma in communications, I landed this job due to my blog (cutting long story short). I interviewed Shekhar Ravjiani and Zanane Rajsingh and also some successful women who are great entrepreneurs from Gujarat. It was fun to review some amazing restaurants like ‘Papa Nino’s’ and ‘24/7 All Day Dining Coffee Shop - The Metropole Hotel’. Shivli, my boss helped me initially with some basic ‘do’s’ and ‘do not’s’ of journalism. However, later on, I learnt a lot from her- about many different things. I love internships as they teach you a lot of other things besides your job. This was my second internship; the first one was in Quality Assurance when I was in the third year of my college. You are ever ready to learn and unstoppable when it comes to work. Besides, if you are a female working for a women’s magazine, you would surely love your work. It just makes you feel good about yourself and hence about the world. I am rejuvenated and ready to take on the world. My best friend Marisha who works in NavGujarat Samay had her office on the same floor as mine. Happy coincidences! I made some new friends as well. It was a great experience which has opened various other avenues for me.